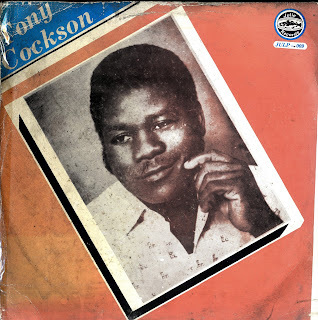 For the next selection on the highlife turntable, I have selected the track Okubo Izom Ke Emi by Anthony Cockson off a Julie Records release dated 1988. John Beadle has written about this artist before, but he did not have a lot of information other than he was an Ijaw musician from Tarakiri in the Bayelsa State who had an oddly poetic voice and a hypnotic bass line. His name came across my musical radar when I asked Peres Bestman Doupere, the son of the singer Bestman Doupere, who the people were in some pictures I found on the back cover of a King Ebizimor LP. He identified one as his father and the other one as Antony Cockson. He told me that Ebizimor, his father and Cockson were all from the Angalabiri Community in Sagbama. Both men were backup singers in Ebizimor's band before going off on their own solo careers. It also appears that Cockson had his own record label called Cockson records. It took me a while to find this LP, but it was worth the wait. The song is a 16 minutes long and the vocals and bass line are complimented by some nice percussion work. John was right about the vocals and the bass line. There are several points in the song where Cockson just goes off and does some really pretty cool singing. You'll know what I am talking about when you hear it. I've been listening to this a lot lately and it has peaked my interest in Izon highlife.